Yesterday I was at Niagara-on-the-Lake for the first time in about a year. If the dictionary sported photos along with definitions under ‘picturesque’ you’d find an image of this quaint theatre town of 15,000 people which is home to the Shaw Festival. Because my plantar fasciitis isn’t much better after over a year of sheer plantar HELL (yep, I have a doozy of a case that physio, expensive custom made orthotics and shockwave therapy haven’t helped, and some nice heel spurs – ouch – now show up on X-rays) I can only walk at a purposeful pace for about fifteen minutes before intense heel pain stops me in my tracks or up to an hour if I can amble at a shopping mall/supermarket pace. 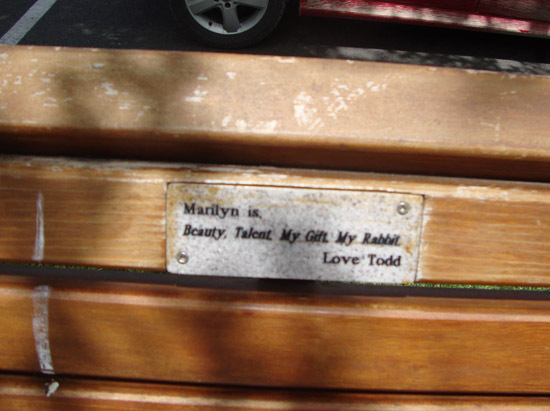 As a result I spent *a lot* of time on the benches that line Queen Street yesterday. A lot, a lot! 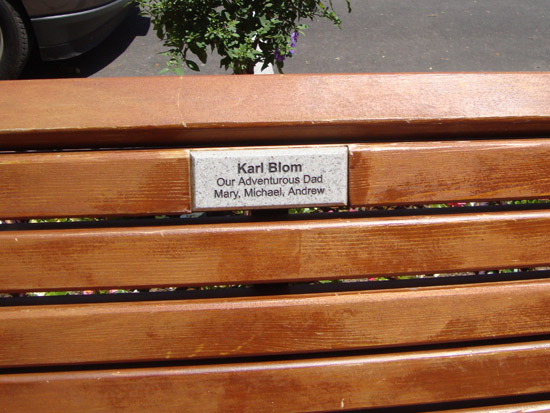 Thankfully there are many benches, with some interesting and heartfelt remembrance plaques to go with them. 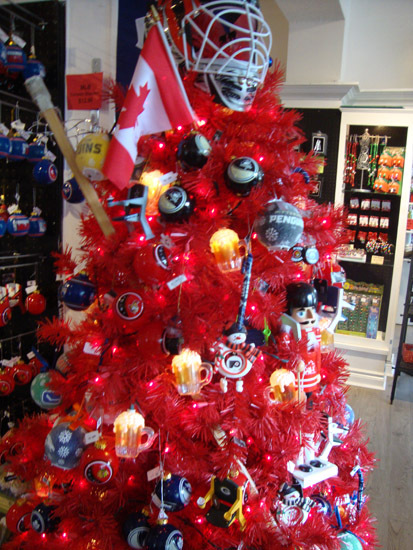 While in town one of the highlights is always the Christmas shop, which features gorgeous and kitschy (like this NHL themed tree) decorations alike. 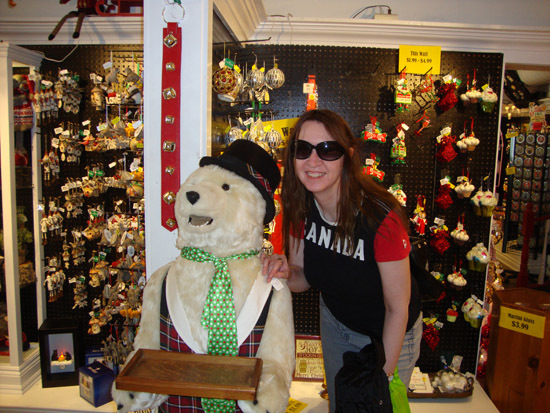 I made sure to say hello to my old polar bear friend (photo of my previous visit with him here). 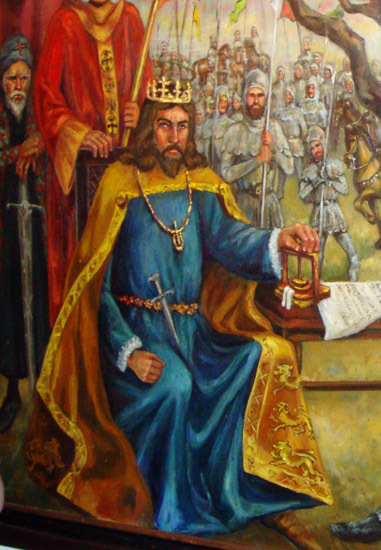 He's such a fine dresser that he makes me feel schleppy. 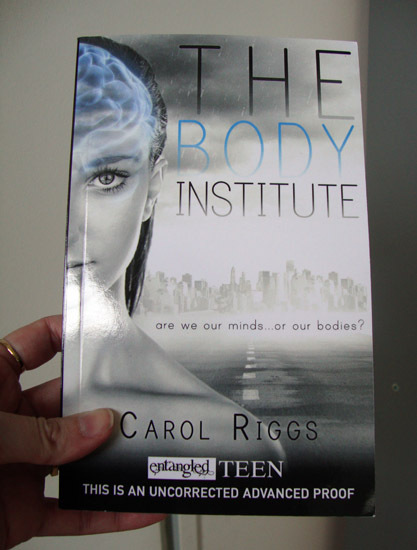 And, of course, one of life's biggest pleasures is exploring great independent bookstores! 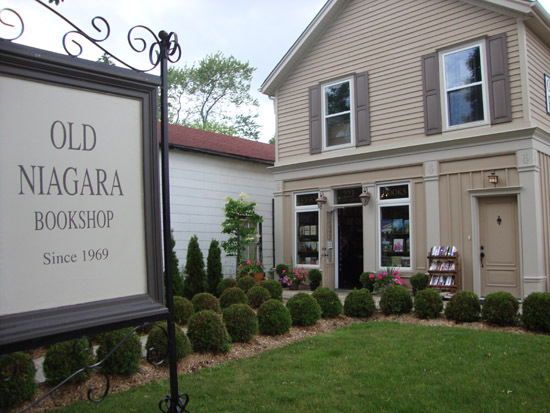 So if you're in the area don't miss the charming Old Niagara Bookshop on Regent Street. You'll want to pick up something from their wonderfully unique collection. 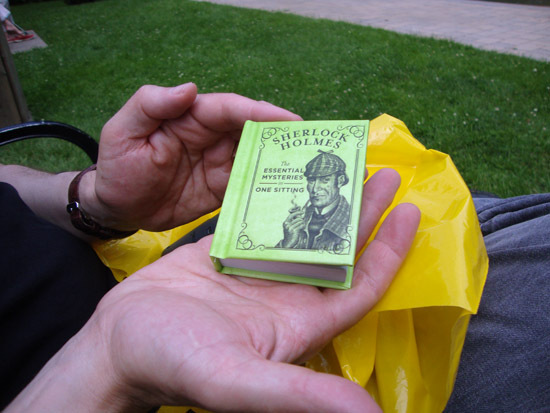 One of the books we snapped up was this adorably tiny version of Sherlock Holmes: The Essential Mysteries in One Sitting. In Niagara-on-the-Lake even your dog gets the Downton Abbey treatment! 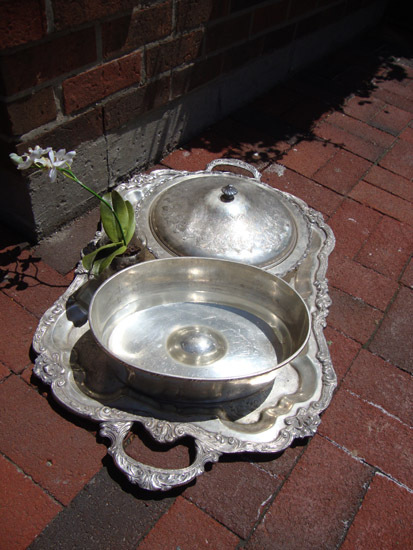 Look at this water bowl, on an ornate platter and complete with a flower for decoration, left out in front of a local shop for your pooch to drink from. 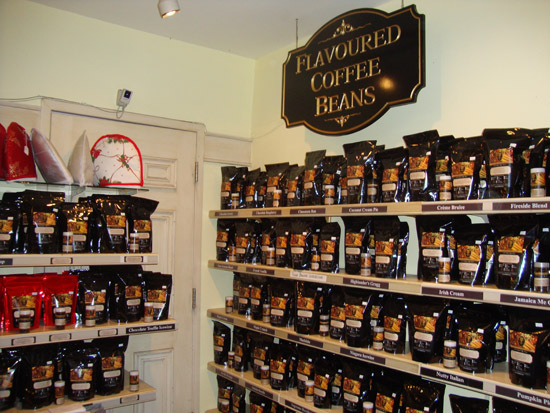 Paddy is a huge fan of the flavoured coffees at Victoria's Teas & Coffees which makes stopping in there a must also. For non-coffee or tea people, like me, they have a great gelato collection too. Lastly, rarely do we visit Niagara-on-the-Lake without dining at The Olde Angel Inn, Established in 1789, it's the oldest operating inn in Ontario. That considered, its reputation for being haunted is hardly surprising. They also serve exceptionally tasty pub food. 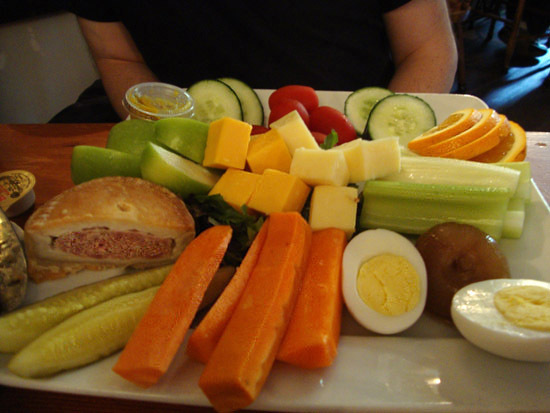 Below you can see the Ploughman’s Lunch Paddy ordered: a selection of cheeses, fresh vegetables, fruit, pickled onions, hardboiled egg, Piccalilli, Branston Pickle and served with fresh bread and crackers. 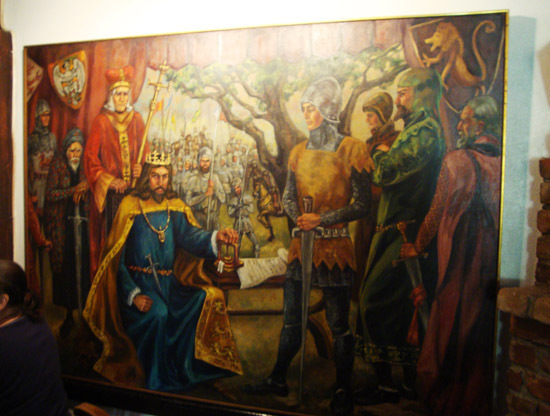 I've been seated by this picture of King John signing the Magna Carta several times and always have a hard time taking my eyes off it. One of the wait staff noticed me snapping pictures of it and kindly moved a coat rack out of the way so I could capture an unobscured view. Then she shared the first of several ghostly stories about the inn. She's been working there for over ten years and on this past June 12th, the eight hundred year anniversary of King John's signing of the Magna Carta, the above painting, which has been hanging on this wall for over fifty-five years without incident, suddenly flew off the wall and hit her forcefully in the back. When I reacted to her account with equal parts delight and anxiety, she showed me a recent letter from a female inn guest who had written to her describing her own ghostly encounter while staying in the General's Quarters, in the bedroom closest to the sitting room. There she was awoken in the middle of the night by the smell of cold ashes and a dark, shapeless presence who began pulling at the bed covers and pillow. 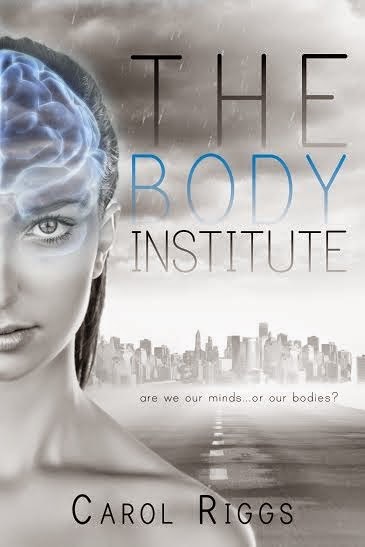 Her sister, in a separate room, also had strange experiences and the second night, freaked out by the strange energy of the place, the two ended up cowering in a room together until dawn arrived. The guest concludes her correspondence by vouching for the presence of active spirits in the inn but stating she had a thoroughly enjoyable stay nevertheless. So slow were Paddy and I to finish our lunch that I was able to coax a third story out of the same employee, this one involving the table next to us. Some time ago a woman and her young son were having a meal there. The pub's bathroom is located downstairs and at one point the woman took her son down. Once they were back seated in the restaurant he asked her matter-of-factly who the man with no feet at the top of the stairs had been (although there'd be no one there!). But apparently the woman didn't think much of it at the time, or until some point later when she was at home looking through photo album pictures with her son. He pointed out at photo of his great grandfather (a man he had supposedly never met) and said that was the man he'd seen at the top of the stairs that day. 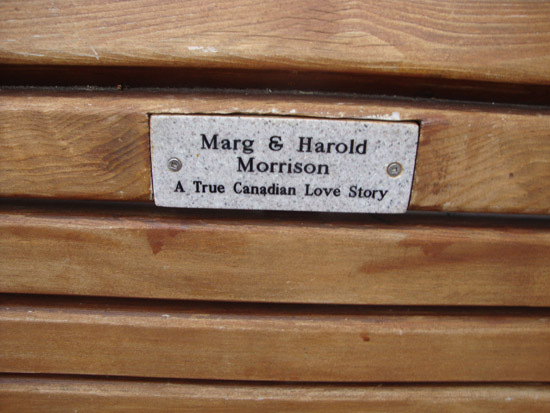 Eventually the customer shared this story with the employee I was speaking with, who didn't have any further details about who the great grandfather was and whether he'd ever lived in the Niagara area. Personally, I wonder if the boy may have thought he was the same man because of old fashioned clothes and style the apparition could have been sporting, but either way it makes a very cool story and I really appreciate her taking the time to share these incidences with me. If you want to read more about paranormal activity at the inn you can start at this Niagara website, and the inn's own site. There are also a couple of accounts on a Toronto Ghosts page and whether you're into ghost-hunting or just want to grab some good food, The Olde Angel Inn is a great place to spend some time while in Niagara-on-the-Lake. 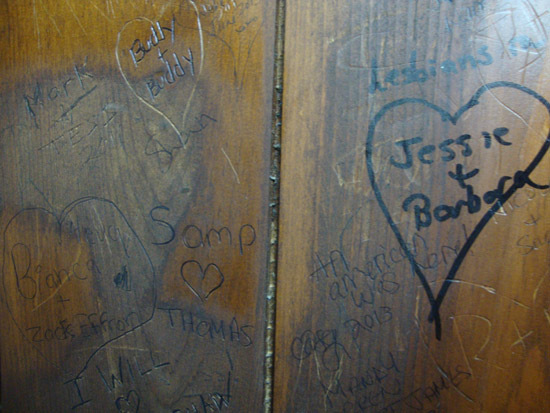 But lest you think it's all about the nosh and the goosebumps, the Olde Angel Inn also has a romantic heart. 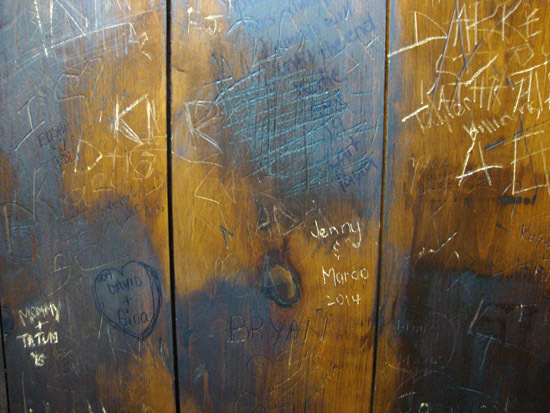 The wooden walls of the women's bathroom stalls are entirely covered in declarations of love. Most of them etched roughly into the wood and others inked on with marker. 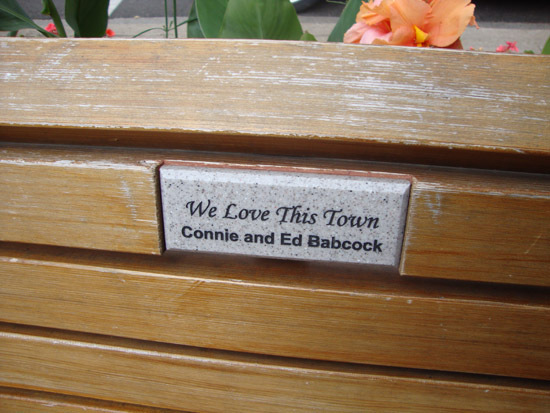 And don't forget to read some of the dedications on the town benches--they tell mini stories of their own!